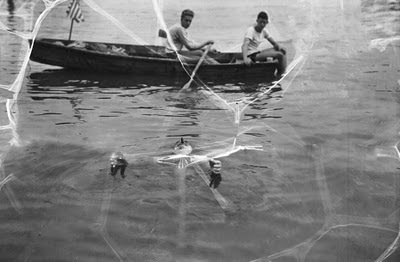 Charles Zimmy smokes a cigar as he floats on his back during his epic conquest of the Hudson River in 1937. BELOW: Zimmy as featured in a 1986 Ripley's "Believe It Or Not!" 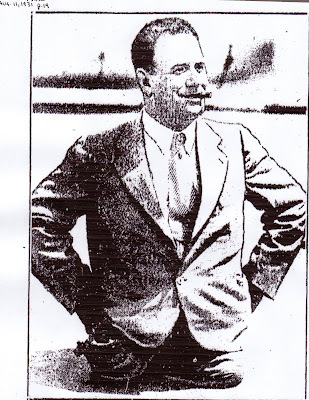 cartoon and in a 1931 photograph in the Toronto Star. Howard Kessler, who died earlier this year, was a reporter in Oregon and California. He gave up the trade soon after the failure of his Mill City Log in an Oregon mill town. He then worked for the California Farm Bureau and later became a bookseller. In 1934, he interrupted his studies at the University of Oregon to travel through Morocco and Western Europe. He filed dispatches to his hometown newspaper, the Lethbridge Herald, in Alberta, Canada. (His father hailed from a family of barrel manufacturers from Dayton, Ohio. They settled on the Canadian Prairie near a hamlet named New Dayton after their old home.) On his overseas expedition, Kessler interviewed the tennis great Bill Tilden over a roast beef dinner at The Savoy in London. In his career, he also had interviews with a handful of Hollywood stars, including Shirley Temple and Groucho Marx. Of all the famous personages he met, the one with whom he was most impressed was Charles Zimmy. He had first read the name in a Ripley’s “Believe It Or Not!” cartoon. Kessler wrote that he found his conversation with Zimmy in a Spanish cabaret so engrossing that he nearly failed to notice the gyrations of the nearby cabaret dancers. The swimmer made appearances on the carnival circuit as The Legless Wonder and The Human Fish. He tried to conquer the Catalina Channel, but failed, and had to abandon an attempt to cross the English Channel in 1933 after being stung by a jellyfish. Despite those disappointments, the determination of the legless man caught the public imagination. Zimmy claimed the record for continuous swimming by completing 100 consecutive hours — four days and four hours, plus 15 seconds, just to be sure — in a swimming pool in Hawaii. In 1937, he splashed into the Hudson River from off the end of a dock at Albany, heading south to New York. He battled river tides, twice needing to pass Saugerties after he was carried back upstream. Zimmy liked to amuse those who came to cheer him on by smoking a cigar as he swam on his back. Newspapers covered his daily progress in breathless prose. After six days in the chilly waters, his torso slathered in grease to retain heat, he called it quits at the 129th Street ferry dock in Manhattan. He boldly suggested his next attempt would be to swim from Key West to Havana. The newspaper coverage of Zimmy’s exploits seems to evaporate after 1937, his fate a mystery. He simply disappears from the printed record. 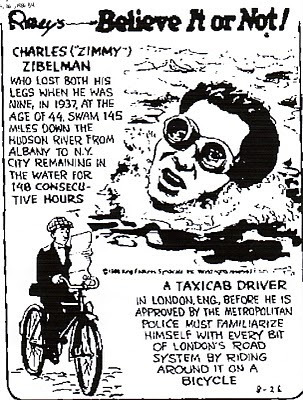 “Charles (‘Zimmy’) Zibelman, who lost both his legs when he was nine, in 1937, at the age of 44, swam 145 miles down the Hudson River from Albany to N.Y. City, remaining in the water for 148 consecutive hours.” Believe it or not.